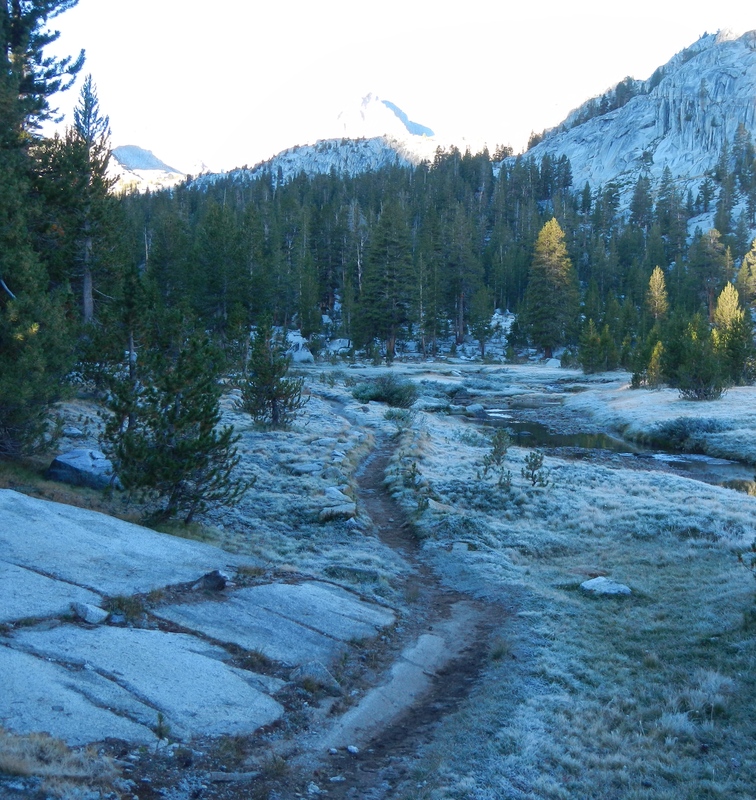 A cold, frosty morning at Rosemarie Meadow. This morning, the meadow was frosty-gray where yesterday it was lush, sunny green with horses grazing on it. The horses are gone up the trail ahead of us. COLD this morning! 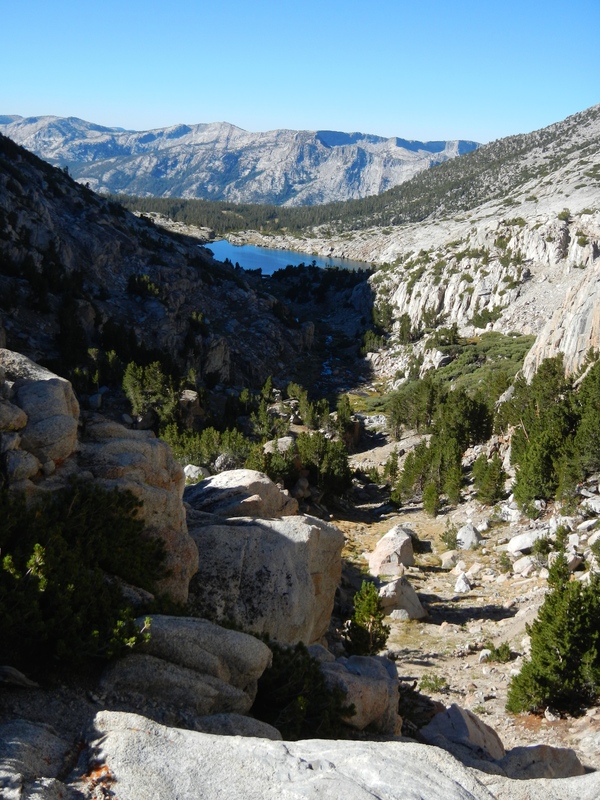 A good time to hike up to Selden Pass, which was beautiful–an easy grade until the last little bit. 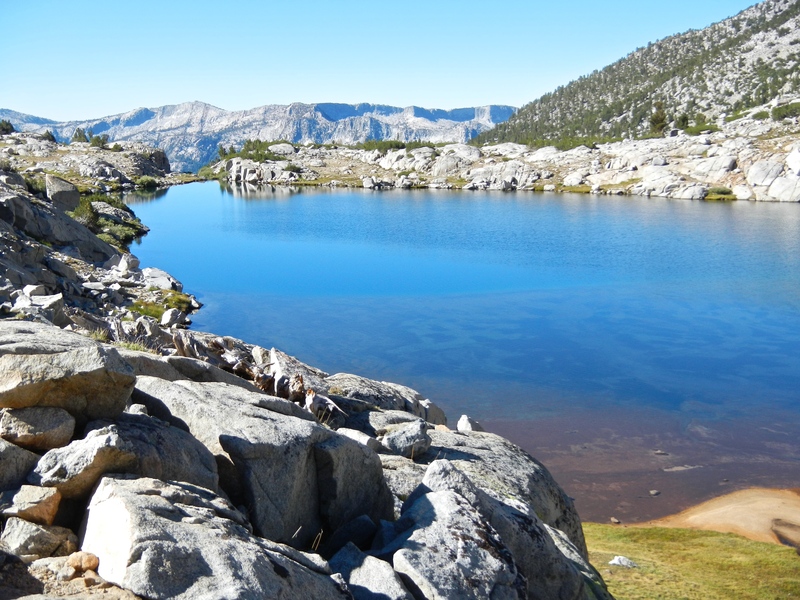 Marie Lake, up near the pass, was a surprise: so big and very glacier-scraped Norwegian-looking gray granite. There was a little glitch in planning, and what we had on the schedule as a 4.4-mile day turned out to be about 10 miles. I got whiney about the extra miles, as I had been looking forward to an easy day. But oh, well. There’s no way to shorten the distance between two points on the trail… I just have to woman up and make the best of it. Luckily, Beauty surrounds us, and there’s no place I’d rather be. Marie Lake. We stopped and spent a little time just being there and filtering more water. 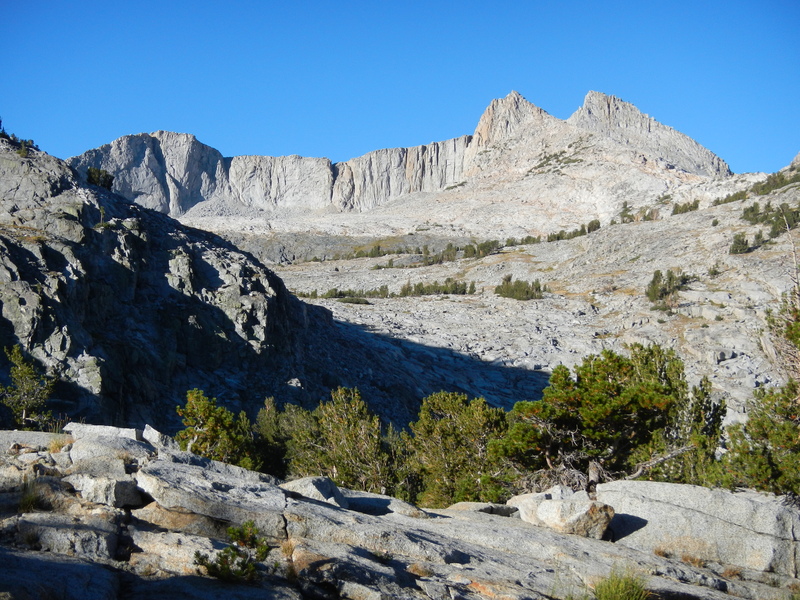 That saddle on the ridge is Selden Pass. 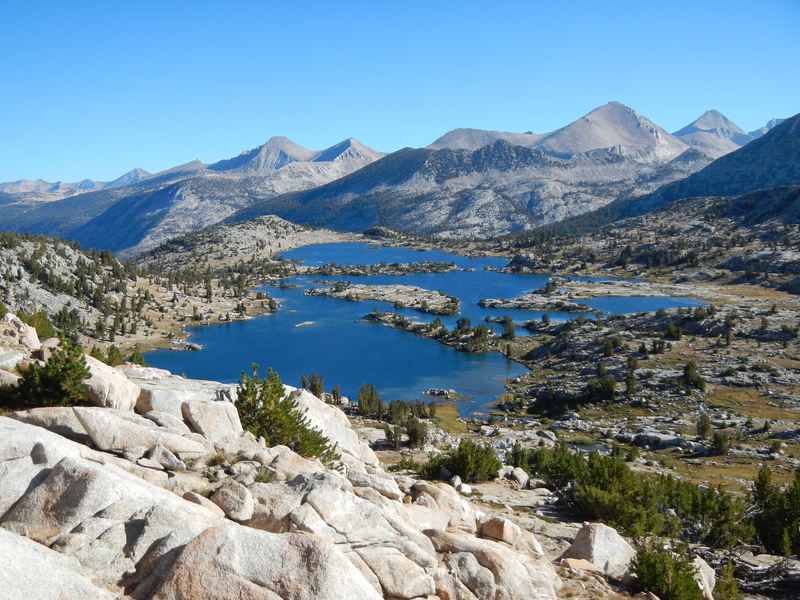 Looking back the way we came at Marie Lake, from Selden Pass. Up at the top of Selden Pass, there was a hiker who had been out by himself for awhile, I think. Very eager to engage in conversation with anyone passing by, and so joyful! We talked for awhile, and I mentioned that we had been following the footsteps of a man and a woman that morning, the woman generally walking behind the man (I was practicing my tracking skills). He confirmed that they had gone by, and were in a hurry. They weren’t interested in stopping, much less talking with anyone. I enjoy most of the little conversations with passing hikers, now that there are fewer people on the trail. An easy camaraderie develops, and nearly everyone seems content to be where we are. Looking south from Selden Pass to Heart Lake. 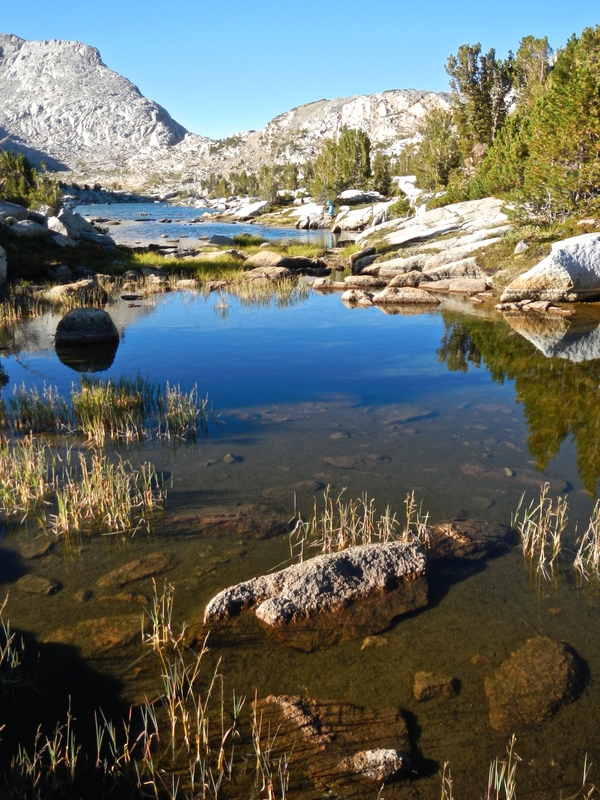 A closer view of Heart Lake, which was perfect in every way. Then it was a long, long downhill trail (about 7 miles), past Sally Keyes Lakes (which, if you didn’t look at the surrounding mountains, looked very much like they could have been in northern Minnesota, surrounded by pines and just perfect for canoes). 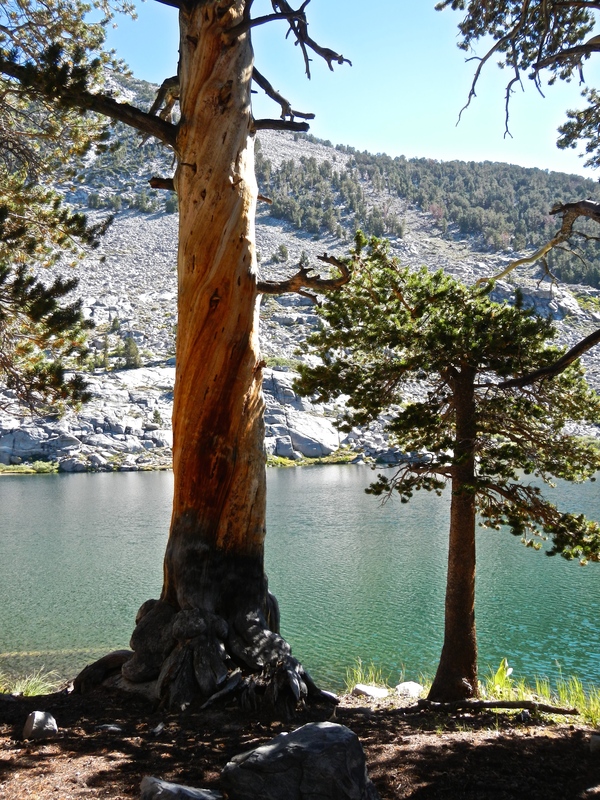 A picturesque dead tree at the edge of one of the Sally Keyes Lakes. If I had more time, I’d probably photograph every tree between Yosemite and Whitney, dead or alive. 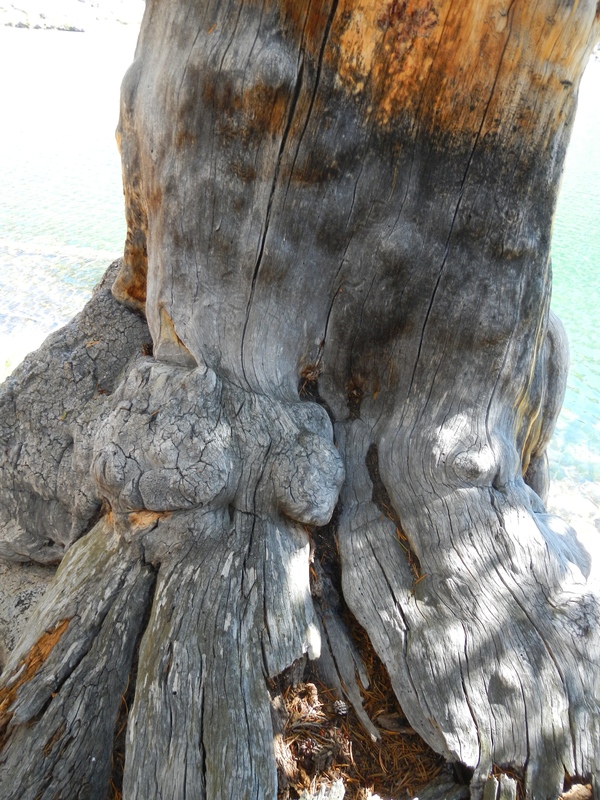 Close-up of the gnarly tree trunk. Muir Trail Ranch is lovely and quiet. As soon as we got there, I weighed my pack, which by then was at its lightest since Red’s Meadow. It weighed in at 25 pounds, without water. So I must have been carrying close to 30 over the last few days. I felt like a wimp, as I was certain that it must weigh over 30 pounds. But Betty is a good planner: she said she would keep our packs under 30 pounds, and she did. I’m just not broken in to the pack yet I guess. We sat in line for showers and now I sit in line for the opportunity to wash our clothes in the old machine, which requires feeding the clothes through an old-fashioned hand-cranked wringer between the wash and rinse cycles and then again at the end. Then we’ll be in line for the hot soak in the springs, and then in line for dinner. Nice to be here, though. 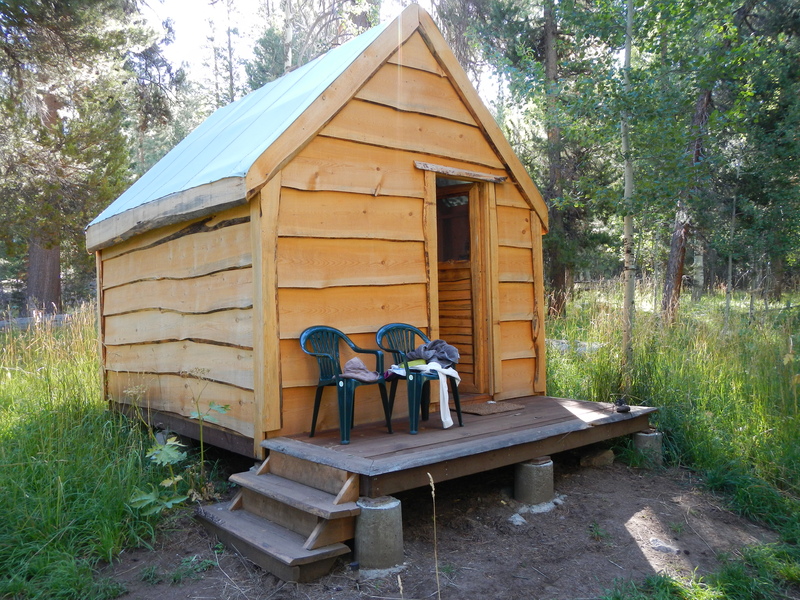 Our tent cabin at Muir Trail Ranch. Interesting to sleep “indoors” again. I missed my tent and sleeping pads, actually. I just put the laundry in. Let it run for 10 minutes, wring, rinse, wring, hang on the line to dry. The clothes instantly turned the clean water dark gray/brown with all the trail dust and dirt. It’s 4:00. I should be done by 5:00, and then I’ll have time for the hot soak before dinner. Thanks for sharing your adventure with us. Beautiful country.